Majestic Beach Towers is one of Panama City Beaches newest resorts (August 2005) with all first class amenities. Our private beachfront balcony located on the 7th floor overlooks the sugar white sands of the Gulf. You will enjoy a beachfront pool, heated indoor pool, kiddie pool, hot tubs, tennis courts, stadium seat theatre, Majestic Market with a Starbucks franchise, and a poolside cafe. Our large deluxe studio condo has a comfy King Size Bed with a full new modern kitchen. A perfect couples retreat. Wake up looking out at the most beautiful beach in the world, totally energized in this Majestic Resort deluxe studio condo. We offer our own PRIVATE parking space for our condo located in a convenient, prime proximity for safety and easy access to the resort in the Majestic Parking Garage. Only select units have their own private parking space at the resort. THE ONLY PROBLEM YOU WILL HAVE AT OUR CONDO IS LEAVING ! Fitness center available onsite for a fee. Panama City Beaches newest resort with Majestic Market, Starbucks, indoor heated pool, outdoor pool with Poolside Cafe, 2 hot tubs, tennis courts and stadium seat theater. The only problem you will have while vacationing at our condo is LEAVING! The condo was nice and cozy. Just the right size for three of us. It is conveniently located and has a great view. We will be back. The room was nice and our stay was so relaxing and nice . I have stayed in same condo for about 6 years when I come to PCB. 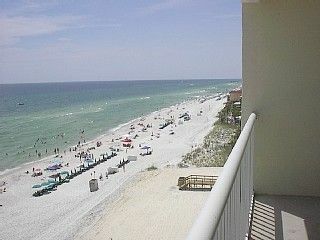 It's just right for wife and I.
Panama City Beach is a popular family destination. At Majestic Beach Towers you will find everything you need for a great family vacation with lots of memories. Located on the 7th floor gives you an amazing view of the beach. High speed elevators insure no waiting around. You have 650 Feet of private beachfront, large outdoor pool with deck area to relax, Poolside bar and grill to order a meal or snack, two hot tubs, a large indoor heated pool, fitness center (fee), undercover parking, and conveniently located in the heart of Panama City Beach. You can walk to famous Pineapple Willie's for a great meal and incredible view of the sugar white sands of the Gulf of Mexico. Linens, towels provided, full kitchen, bathroom, washer/dryer, spacious balcony with lounge chairs and table to enjoy the great sunsets, cable TV with DVD/VCR player. No Smoking both inside condo and outside on condo balcony, No Pets allowed, minimum age 25 and up. June and July rentals are weekly rentals, minimum of 7 nights, preferably from a Saturday to a Saturday. Monthly Rates only apply for the months of November 1 to February 28th.